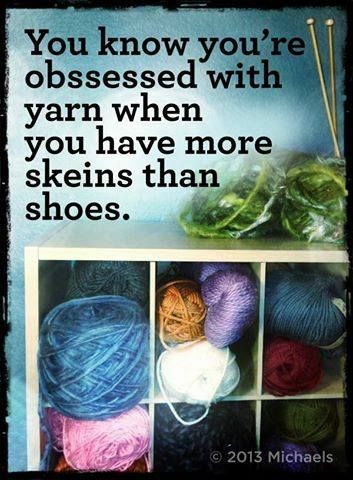 If you don’t constantly consider the best way to organize and store your yarn, then you obviously don’t have enough yarn. 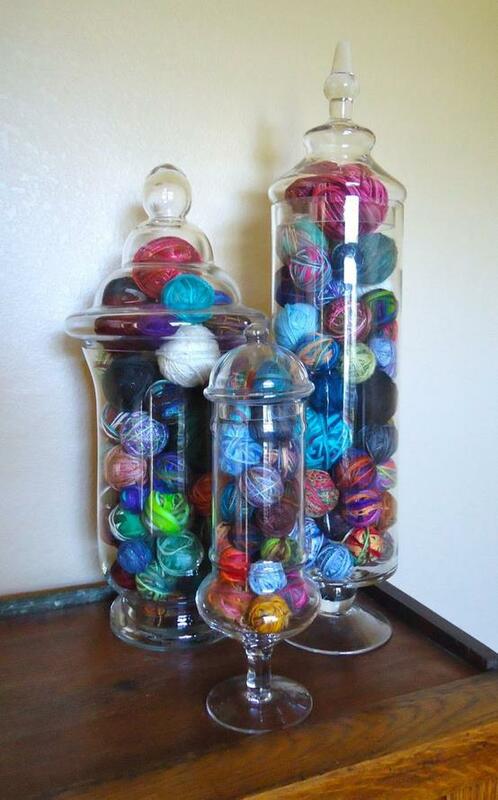 Here’s a few ideas on the best way to store your yarn, whether your stash is large or small. Decorative Glass Jars. Source Unknown. This is a great way to store all those little scraps of yarn you have left after a project. 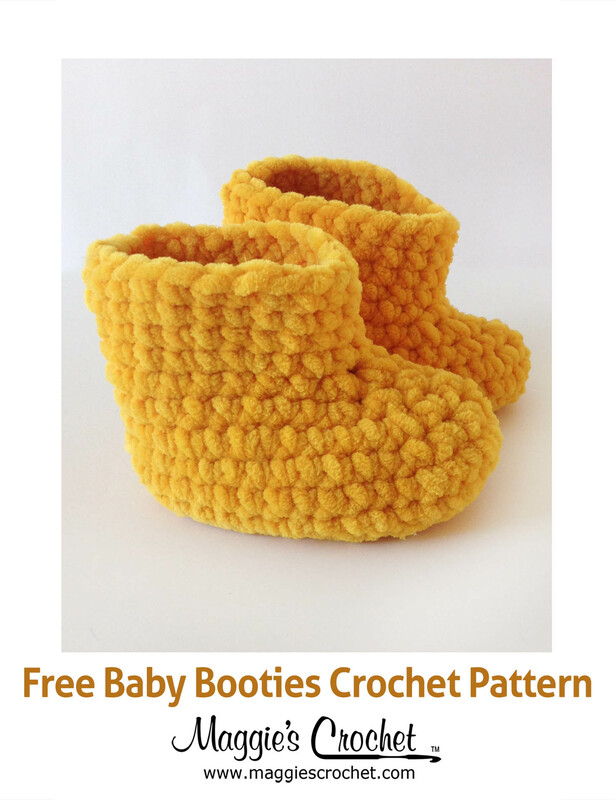 Just wind them up into balls and store in a beautiful glass container. This solution is pretty enough to be left in plain sight as decor. Glass Jars with Chalkboard labels by Raising Up Rubies. 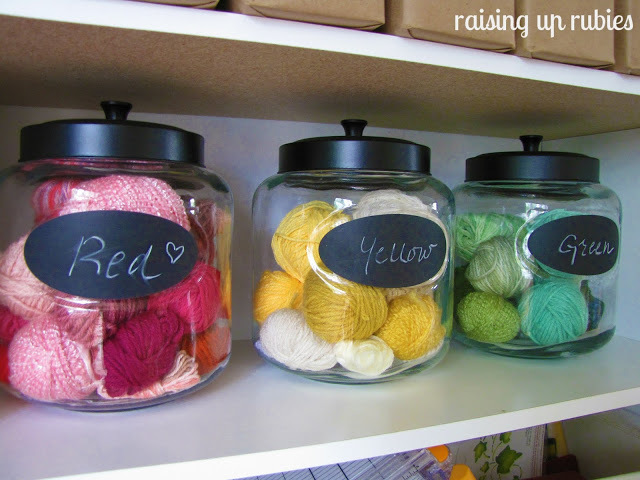 There are many ways to sort your yarn – weight, fiber content, etc – but most aesthetically pleasing is to sort by color, such as these jars with chalkboard labels. Pegboard Yarn Storage by Lorna Watt at Knits for Life. 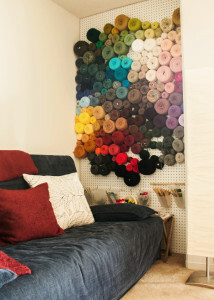 This yarn storage idea not only displays all your skeins, but they are also usable directly from the wall. 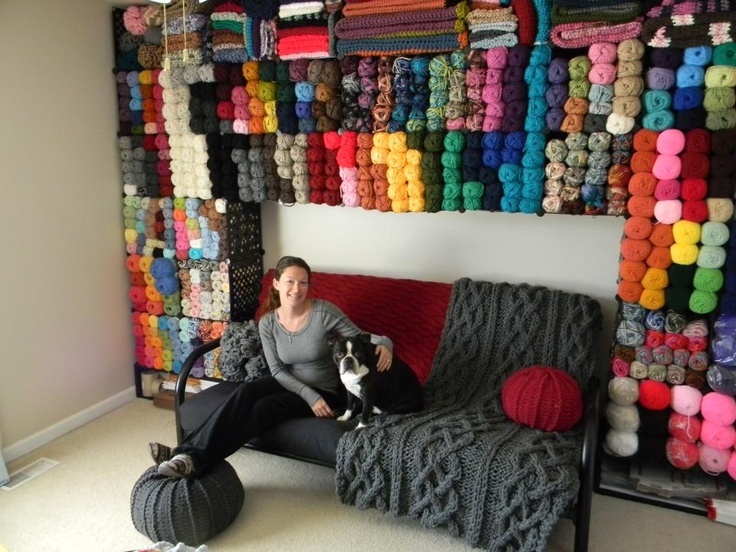 This knitter rewound all of her skeins of yarn (reducing the space needed by a third!) and mounted them on straight pegs with the center strand hanging out. The only slight issue with this solution is that it doesn’t protect your yarn from dust. Yarn Wall by Lucky Hanks. 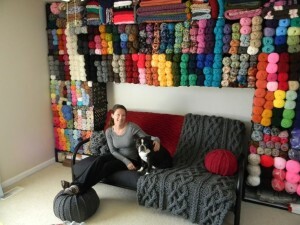 This photo immediately caught my attention for the way the yarn appeared to be floating on the wall! She used the snap-together type shelves that can be bought at many home stores, though she noted she had to add extra anchors to make the entire unit secure. CD Tower Yarn Storage by Morrgan’s Creatures. 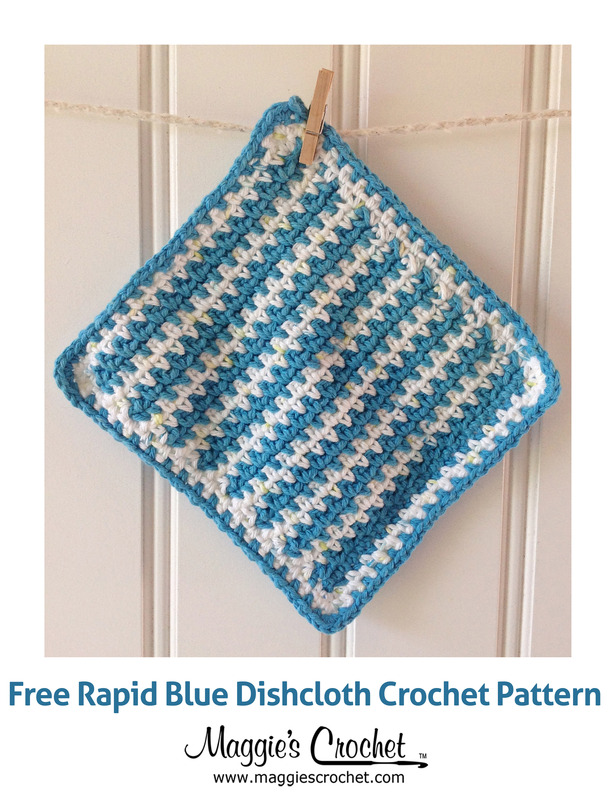 This solution doesn’t hold as much yarn as some of the others, but it will fit nearly anywhere! 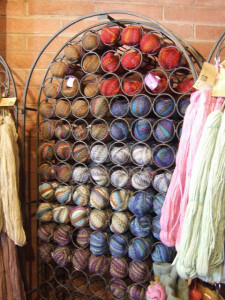 Wine Rack Yarn Storage. Source Unknown. An old wine rack makes a wonderful place to store your skeins of yarn. 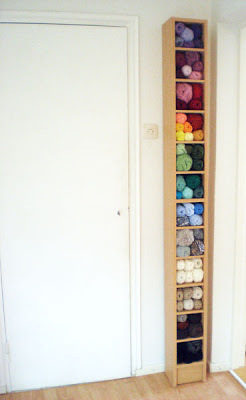 Five Tier Storage Organizer by Crochet & Knit Shop. Great ideas! I don’t know which I will use. Currently, I am using baskets, an old suitcase that is so full it will not close, some file boxes! I think I am going to try a bookshelf….hmmmm.